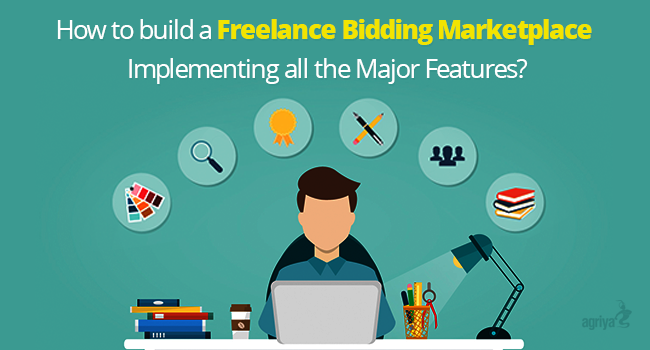 How To Build A Freelance Bidding Marketplace Implementing All The Major Features? The freelancer segment of the workforce has gathered huge attention, especially in the digital service market. More and more people prefer to work on their own terms and the ability to choose their desired jobs based on parameters favoring them. Employers, on the other hand uses this as an opportunity to outsource projects to get it done in a short span of time. A freelance bidding marketplace is a two-sided platform that brings both freelancers and employers together. How A Freelance Bidding Marketplace Works? In a well-constructed freelance bidding marketplace website, the registered employer list the project details along with the specifications about the desired freelancer who is required to complete the project. The registered freelancers get to view all the listings and place their bid for one or multiple projects along with a quote. The employer, after viewing the bids, will assign the project to the selected freelancer. On completion of the job, the specific amount quoted will be paid to the freelancer's account. The various business opportunities as a mediator is huge in the freelance bidding marketplace. With a well-built website, you can provide seamless service to both the segments, the clients and the freelancers and create an automated revenue generation model. Consider these key factors to build successful freelance bidding website or an app. A successful freelance bidding marketplace requires a dynamic website that operates with necessary features at an optimum level consistently. Lets discuss in detail what those features are. As simple as it seems, this should be the fundamental feature for any freelance bidding website. An easy process of bidding helps both the employers and the freelancers to feel comfortable and operate with ease. Having a complex one creates a lot of doubt and leads to an improper functioning of the website. A job listing option that varies from one service required to another, helps the employers to distinguish themselves and reach out to the desired freelancer they require to complete the job. It also enables freelancers to understand the project, the requirement and the time frame to finish it, directly helping them in placing proper bids. A two-segmented marketplace has an high probability of conflicts that arises due to the misunderstandings between the employers and the freelancers. It is very important to have an ideal conflict resolving process that helps to arrive at a fair decision. Prolonging a conflict will directly reflect on the reputation and the functioning of the website. Being a medium in which two segments operate, the freelancer bidding marketplace should have a unique process that handles the transaction once the project is completed. For example an Escrow mechanism works perfectly for the website that collect and release funds based on the terms on which a particular project was completed. Websites like Freelance, Upwork, Elance, etc. have made use of the opportunity perfectly and created a successful and established freelance bidding platform. The common denominator for all these sites are how systematically they were able to perfect their sites with features that helped both the segments they were offering their services. For an entrepreneur who wishes to tap into this resourceful marketspace and replicate their success, a clone script is the best option. Lets look into a clone script that added up all the functional features that can help you in creating a perfect freelancer job bidding website. Crafted with features that synchronize with all the requirements, this Elance clone script from Agriya helps in constructing an immaculate freelancer bidding website. This clone script-enables a dynamic functioning of the website, making sure both the employers and the freelancers benefit from it. Choosing this Agriya's Elance clone script empowers you to multiple financial and business possibilities. ➔ Listing Fees, from employers who wants to list their projects on your website. Urgent and featured listing fees are collected based on priority and visibility respectively. ➔ Commission Fees, from freelancers and employers and skill test commission fees for conducting the tests at various levels. The success of a clone script is its ability to reach out to multiple verticals and Agriya's freelancer clone script with many highlighting features makes sure your website can cater to multiple high-end verticals effortlessly. The civil and engineering, arts and entertainment and education are to name a few. To reach progressive success in a marketplace like freelance bidding, where major players have established impressive benchmarks, an ambitious entrepreneur need to think and act smartly. With all major features incorporated and ready to use, Agriya's freelance marketplace platform scripts will be an ideal option to kick-start the journey towards the desired success.